Have you been thinking about having your eyebrows microbladed for some time now? Well, here at White Tara we have a new Microblading technician who is offering a very special price of £200 per treatment. This cost includes a touch up 4-6 weeks after your initial treatment. This special offer is for a limited time only after which the treatment costs £295. 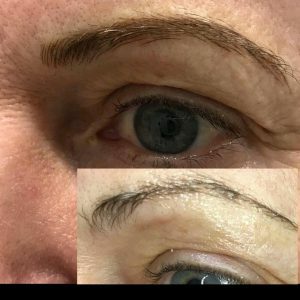 Microblading is a technique where a manual tool is used to insert pigment into the top 3 layers of the skin. It is considered semi-permanent because it is applied to the layers of the skin that regenerate and eventually slough away from the outermost layer of the skin; and for this reason, to keep the colour and design looking fresh, it is recommended to get touch-ups on the treated area every 6-18 months, depending on the client’s skin type and lifestyle. Clients will typically have an initial treatment which will heal after 4-6 weeks. A second appointment for a touch-up is suggested around 6 weeks after the initial treatment to fill in any areas that did not retain pigment and to add more depth to the treated area. Sometimes a client’s natural undertones in their skin may have unexpected effects on the ink’s colour which may also need to be adjusted. These kinds of corrections are normal and are just a part of the semi-permanent makeup application process, as everyone’s skin is different and accepts ink differently. For more information and to see her portfolio of work please visit www.highbrow.services or contact Emma directly on 07701 029168 or through Facebook.